After barely posting, and really struggling to find this blog's voice, I've decided to put it to rest. But that doesn't mean I'm not still cooking and writing! The vegetarian and I have started a new blog -- The Omnivore and the Vegetarian. It will be (mostly) vegetarian recipes, reviews and drinks, chronicling our adventures as we adapt to life together, still focusing on the seasonal, local and organic. Come check us out; we'd love to see you there! When most people think of figs, they think of dried Calimyrna figs, those light brown sticky figs that my grandfather used to bring home along with bags of assorted nuts. While an excellent snack (and all the more so because, dried, they're available any time), in my opinion they are nothing compared to fresh black Mission figs. Not very sweet, these have an almost musky taste and, in all honesty, often pair better with savory foods than sweet. That said, upon deciding one day that I had a hankering for figs, I decided to use them in a sweet preparation -- namely, a buttermilk fig cake. Now, I'm a very nervous (and inexperienced) baker, so I'm always wary to diverge from a recipe. However, I just couldn't find a recipe that incorporated everything I wanted! You see, the older I get, the more my sweet tooth disappears. So I couldn't have a cake that was terribly sweet (sacrilege, I know). And that meant I wanted a mix of fresh figs and dried. I also wanted lots of spices, since gingerbread is one of the few cakes the vegetarian is truly fond of. And some nuts to cut the sweetness. I ended up combining several recipes and, much to my delight (because I kept muttering under my breath that it would never work), the cake was both delicious and not very sweet! More like a spice cake than anything else, it would be wonderful with afternoon tea. We shared it with friends, who were big fans as well. I hope you agree! Preheat oven to 350F. Beat eggs and egg whites in a mixing bowl until frothy. With beaters still running, add in granulated sugar, vegetable oil and fig preserves. Sift together flour, nutmeg, allspice, cloves, cinnamon, kosher salt, baking soda and baking powder. Add sifted dry ingredients and buttermilk, alternately adding a little of each, to egg mixture. Mix very well (it helps if you have an extra set of hands -- one person adds ingredients while the other mixes). Mix in vanilla extract. Fold in fresh figs, pecans and dried figs. Spray a 9-inch springform pan with cooking spray. Pour batter into pan. Bake 55-65 minutes, until a chopstick inserted into the middle of the cake comes out clean. Remove from oven and cool 10 minutes. Meanwhile, in a saucepan over medium-high heat, combine buttermilk, powdered sugar, baking soda, cornstarch and butter. Bring to a boil. Cook 2 minutes, stirring. Remove from heat and allow to cool completely. Stir in vanilla extract and Grand Marnier. Remove sides from springform pan. Drizzle glaze over cake. Enjoy! Make It a Meal: So your guests still have room for dessert, precede this cake with a light dish of Olive Oil Roasted Eggplant with Lemon, served over fresh pasta. The cake is wonderful topped with vanilla ice cream or even whipped cream. Drink Pairings: A Zinfandel, such as 7 Deadly Zins was great with the main meal, but, since you've already opened the bottle of Grand Marnier, why not spice things up a bit and make Sangria? I recommend White Zinfandel Sangria; it would even work with the cake! Leftovers: Leftover cake makes a wonderful breakfast the next morning. It also works as an afternoon pick-me-up, particularly with a cup of tea! How did it get to be October already? And me with a backlog of summer recipes! Luckily, heirloom tomatoes are still beautiful and all over the greenmarket and watermelon is in abundance at Fairway. When I was a kid, watermelon (and cucumbers) were the only two foods I refused to eat. Their high water content diluted the flavor so much as to make it unpalatable to me. Lately, though, I've found that, when it's terribly hot out, I crave these watery fruits. Probably my body seeking to rehydrate itself as much as possible. But, because I have a low tolerance to sweet, I needed to add something salty to the watermelon and tomatoes. 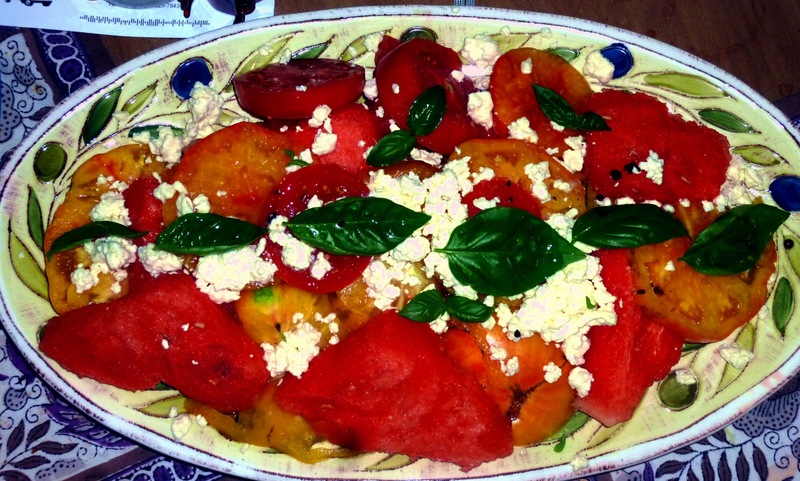 Mark Bittman recommends goat cheese, but I was more interested in feta, as suggested by Josh in his Heirloom Tomato and Watermelon Salad. Some basil (from the plant that's still growing nicely on our terrace! ), a sprinkling of sea salt and a couple of tablespoons of extra virgin olive oil and we had ourselves a delicious salad. Enjoy! On a large platter, lay down first a tomato slice, then a watermelon slice, overlapping slightly, until all used. Sprinkle with salt, pepper and feta. Crumble basil leaves on top and drizzle with olive oil. Serve immediately. 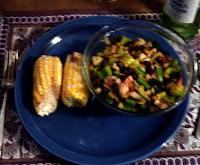 Make It a Meal: Keep the summer theme going by serving the salad with corn -- rather than just steaming it, try Roasted Corn with Parsley Butter. If serving a vegetarian, and since the oven's already on for the corn) finish out the meal with some Roasted Vegetables. If not, go for Salt Roasted Shrimp instead. And to drink? Riesling, especially if you can find a local one like Treleaven Riesling from the Finger Lakes. Bon appetit! Leftovers: Unfortunately, this isn't a salad that saves very well, so eat it the night of, if at all possible. If not, mix leftovers with falafel (if you don't make your own, I highly recommend Trader Joe's frozen variety) to make a more substantial salad. Yum! Far and away, my favorite part of going to the Greenmarket is, when I have absolutely no idea what to make for dinner, to allow myself to be surprised and inspired by whatever delicacies I find waiting for me. Of course, being a planner and mildly OCD, this rarely happens. In fact, I almost never allow myself to go shopping without a list; otherwise I end up going crazy and coming home with various delicacies that have no relationship to one another so then I have to go back out to get whatever missing pieces I've neglected. And some of that produce invariably winds up in the trash, neglected and forgotten. No thank you. So, in an effort to cut down on waste and generally practice more sustainable practices in my kitchen and my life, I use lists. But, also wanting to cook seasonally, I let myself be inspired by what's available. And, sometimes, I cheat. How do I cheat, you ask? When I have work in the morning (but know I'll get home with plenty of time to go back out to the Greenmarket before they close), I first survey everything at the Greenmarket (it's right next to the subway station), file away what looks most exciting, then go home, put together a list and venture back out, this time with Ozzy and a plan. Not long ago, I did exactly this. What piqued my interest, you ask? Jalapeno peppers. While I've occasionally seen these gems downtown at the large Union Square Greenmarket, I'd never seen them at my little Tucker Square Greenmarket, across the street from Lincoln Center. Being so excited, I wanted to highlight them as the main course of my dinner, not merely a seasoning. I'd seen a recipe for BBQ Jalapeno Poppers in The Pioneer Woman Cooks, so I figured that was a good enough place to start. Armed with 18 jalapenos (yes, I counted them), I went home and set to work. Unfortunately, though, I'm actually quite a weakling when it comes to spice. So I needed something (other than the cheese I was stuffing inside) to cut the bite of these peppers. Mandy had made some Jalapeno Poppers with Pineapple, so the cut-up pineapple in the fridge that had been destined for my morning yogurt went into the poppers instead. I also opted to bake these rather than fry them. And, wanting to showcase the freshness of the jalapenos, I decided against breading as well. Make sure everything's at room temperature before you get started; it makes the mixing of the stuffing components much easier. I topped half the poppers (mine) with fresh bacon but it could very easily be left out. Enjoy! Preheat oven to 275 F. Wearing rubber gloves (and after having already taken out your contact lenses for the night -- yes, I did learn that the hard way), slice jalapenos in half lengthwise. Scrape out seeds and membranes with a spoon. If you are less heat-sensitive than I (or if your jalapenos are mild), leave some seeds in; that's where the heat is. In a large bowl, combine cream cheese, cheddar, green onion and pineapple. Now stuff a heaping tablespoonful of mixture into each jalapeno half. Press down well, so there's very little chance of the stuffing falling out (especially important if you're not using the bacon to hold it in!). Arrange jalapeno halves on an aluminum foil-lined baking sheet. If you are using bacon, lay it on top of the open jalapeno half, pressing down to secure it to the filling. Drizzle barbecue sauce on top of either the bacon or cheese filling, depending on which option you're making. Use a pastry brush to spread it around more easily. Bake in the oven for 1 hour. Serve warm or at room temperature. 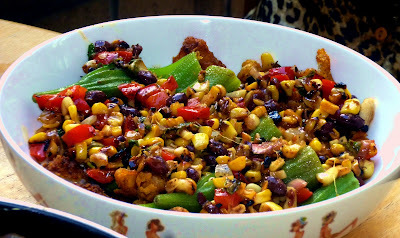 Make it a meal: Serve with plain steamed corn -- an excellent antidote to the spicy jalapenos and a bottle of Riesling. I recommend Nein Lives. Leftovers: These are very rich, so there will probably be leftovers. To repurpose them for another meal, serve over kasha. Bacon-Wrapped Jalapeno Thingies from The Pioneer Woman Cooks! Corn is, to me, one of the most quintessential summer foods. While it is available year-round, I buy it almost exclusively during the summer when it seems to be at every Greenmarket booth. As I see it, it's a great, simple addition to almost every meal (as you can see from many Make-It-a-Meal suggestions). Normally I just steam it, enjoying the corn fresh with butter. Every so often, however, I get the urge to do something more creative. At those times, I turn to cookbooks -- in this case, Courses: A Culinary Journey. A complicated book (by a chef on a cruise line), I find it's best for inspiration. In there, I found a recipe for Charred Corn Relish. That seemed simple enough, but certainly not enough for a meal. It was served with catfish -- not an option when cooking for the vegetarian, though, if you're so inclined please feel free to try it out! Instead, I opted for chickpeas, one of my favorite legumes. I have to say, these battered and fried chickpeas were one of the best things I've ever made. 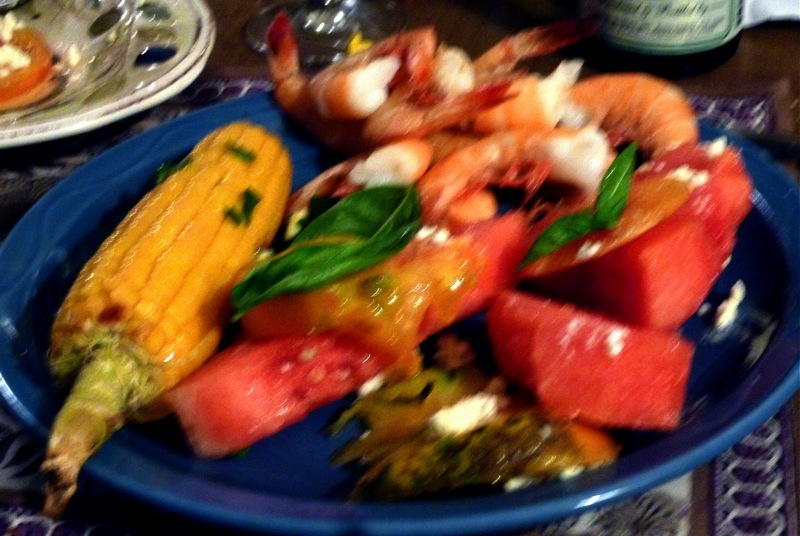 While they were great with all the accompaniments, they'd also be a wonderful appetizer, served with drinks. Wanting to include a green vegetable, I decided to go with okra, one of the few green vegetables that the vegetarian is extremely fond of. Being lazy, and knowing how flavorful the rest of the dish would be, I steamed the okra and tossed it with butter (similarly to how I usually cook corn). However, in order to up the flavor quotient of the rest of the dish, I allowed myself to be inspired by Stir-fry Okra, Chillies & Shallots from. So even though my okra was simple, I used lots of spices for the rest of the dish. This "dish" is actually several different components. Feel free to make only one part, or several -- whatever works for your time constraints and tastebuds. Everything works well together or separately. At the end of the post, under "leftovers", there are some suggestions for how else to use each component. Bon appetit! For a non-vegetarian alternative, you could substitute catfish filets for some or all of the chickpeas. Heat a heavy pan (cast-iron if available) until very hot. 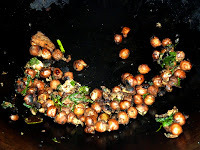 Add corn kernels to pan and allow to char, cooking undisturbed. Add bell peppers and cook, stirring, 5 minutes. Reduce heat to medium and add garlic and shallot. Cook 2 minutes. 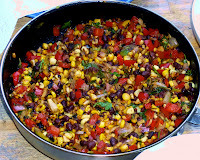 Remove from heat, add black beans, jalapeno pepper, olive oil, lime juice, lemon juice, cilantro, parsley, salt and chile powder. Keep warm. Separate onion rings and dredge in seasoned flour. 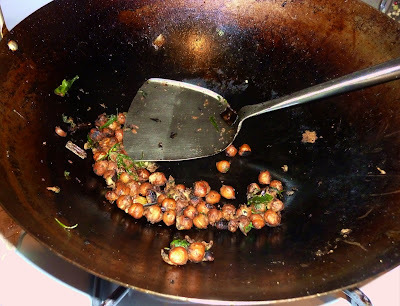 Heat grapeseed oil in heavy saute pan (the same one used to fry the chickpeas) and fry onion until lightly browned. Season with salt and pepper and transfer to a paper towel-lined plate. Let drain and keep warm. 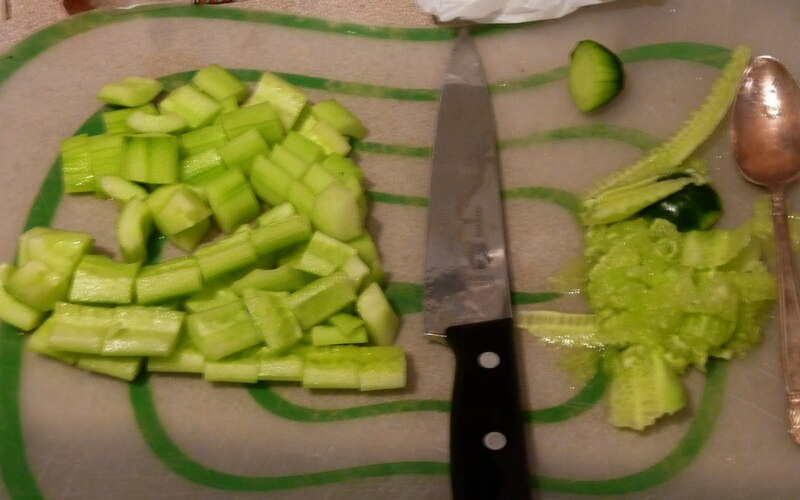 Clean okra and trim stems. Steam 8-12 minutes, whole. Once cooked, chop into 1/2-inch chunks. Toss with butter, salt and pepper. 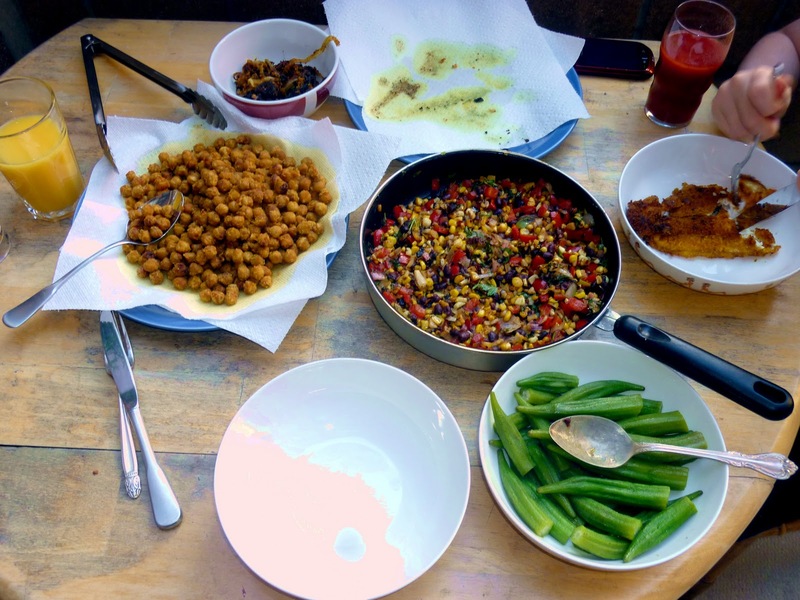 Serve chickpeas topped with corn relish and fried onions, okra on the side. Enjoy! a rose -- I'd recommend a 2010 Biohof Pratsch. Bon appetit! Leftovers: Because there are so many components, I'm going to suggest leftovers for each one. Toss leftover okra and fried onions with kasha. Combine corn salsa with chopped kumato tomatoes to freshen it up. Serve with tortilla chips. Finally, combine some cultures (and add extra seasoning to packaged food) by heating leftover chickpeas (or catfish) with creamy polenta with spinach & carrots, courtesy of Trader Joe's. Sorry for the extended silence -- I went on tour to Minnesota and then came home to a hurricane! We're fine now, the MTA is up and running and, in Manhattan at least, it's back to business as usual. Getting back on-track with work reminded me -- I've been cooking and not sharing the delicacies. So, here's a summer stir-fry for ya! In trying to adapt my cooking styles to jive with a (mostly) vegetarian lifestyle, I've found myself most inspired by non-vegetarian recipes that I then adapt to my own purposes. These Chickpeas with Black Bean Sauce is one-such recipe. Cleaning out the refrigerator, I discovered a jar of black bean sauce. It hadn't expired yet, but I also knew I hadn't used it more than once, when making a stir-fry from The Breath of a Wok . So, rather than throw it out, I decided to use it. Last time, I had used it with crabs. So first I found a stir-fry with crabs in it, Danny Chan's Ginger and Scallion Crabs from Yohana's Culinary Journey. Using that as a jumping-off point, I added in the black bean sauce. Then it was time to think of a new protein. 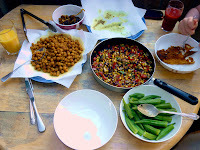 A recipe for Chick Peas and Tuna with Spicy Black Bean Sauce came to the rescue. Eliminate the tuna, combine the recipes and ... voila! Dinner was served. My only complaint was that it was a bit dry. If anyone else has experience (and advice!) 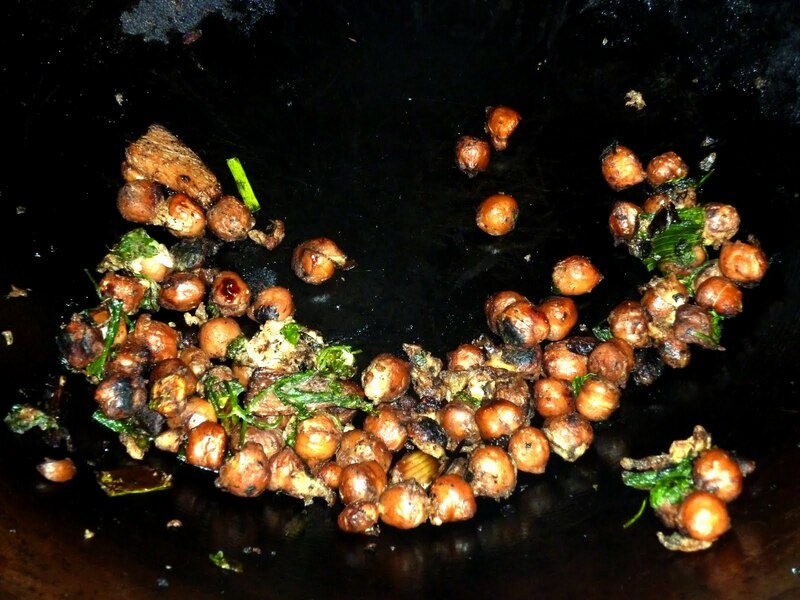 stir-frying chickpeas, please let us know in the comments. Bon appetit! In a small bowl, combine cornstarch with water. Set aside. seconds. Add black bean sauce and stir-fry another 10 seconds. Add soybeans and stir-fry 20 seconds. Add chickpeas and stir-fry another 20 seconds. Add broth, cover and cook 3 minutes, stirring once halfway through. Add soy sauce, sesame oil, salt, pepper, cilantro and green onion greens. Cover and cook 1 minute. Swirl in cornstarch mixture and egg. Stir-fry another 30 seconds until combined. Serve warm. Make it a Meal: This is actually a meal in itself. If desired, you could serve over rice. For dessert, make an avocado milkshake. To drink, I recommend a rose, such as a 2010 Biohof Pratsch. Enjoy! Leftovers: Make soup by pureeing leftovers with warm chicken or vegetable broth. Yum! I don't know how this summer's been for you but, here in New York, it's been hot, hot, hot! Last week there were several days over 100F and, while I know that's mild for some it certainly isn't for us. I'm not terribly heat sensitive but, while our air conditioners made a valiant effort, it was still far too hot in the apartment to cook. During this heat wave, I found that I was craving different foods than usual. For example, I usually prefer cooked vegetables to raw but cucumbers (a vegetable I usually dislike) actually sounded quite appealing. See, when I'm really warm, I crave foods with a high water content in a constant effort to keep myself hydrated. I also crave spicy foods, probably because they make me drink more. So I started looking for cucumber recipes. I first stumbled upon a Shrimp and Cucumber Salad but that certainly wouldn't feed the vegetarian. And just leaving the out the shrimps would turn it into a side dish. 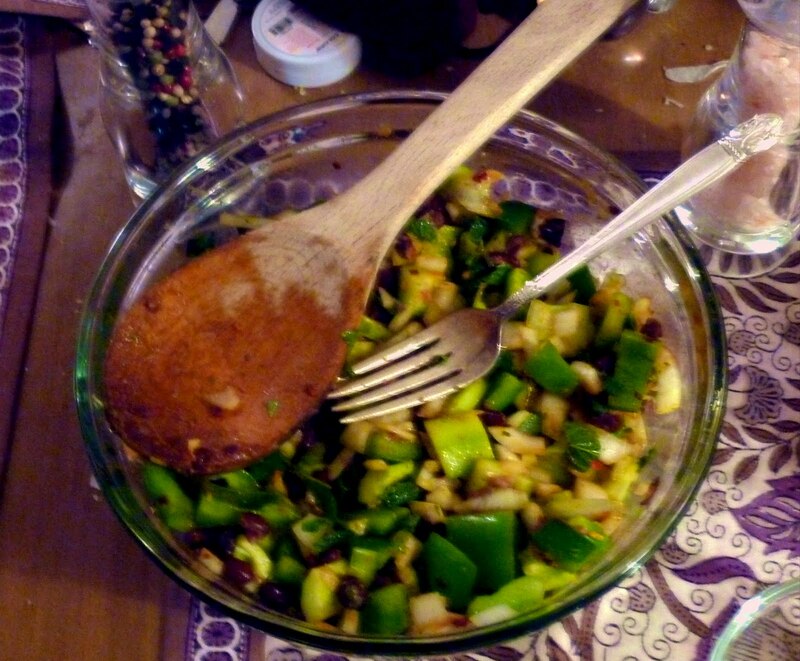 So then I found a Black Bean Cucumber Salad. That convinced me to use black beans so I went back to my original shrimp idea and was delighted to find Kalyn's Spicy Shrimp and Cucumber Salad with Mint, Lemon, and Cumin. With some substitutions and a little imagination, we were all set. Enjoy! Combine all ingredients in a large mixing bowl. Stir well. Adjust salt and pepper to taste. some corn, simmered for 10 minutes (if you can bear to keep the stove on for that long). A great wine we recently discovered is Beach House. Mostly Sauvignon Blanc, it's very easy to drink and perfect for a hot summer's night (and, I'm sure, even nicer if you're lucky enough to be by the beach!). For dessert, chocolate (or vanilla or almond) milk! Bon appetit!